This document describes the process for updating the RCLTFRF command for Robot Client users who have upgraded to Robot Schedule Enterprise. Use this procedure to run your FTP jobs from Robot Client in Robot Schedule Enterprise. You must be at Robot Schedule version 10.28 or higher and Robot Schedule Enterprise version 1.06 or higher. You must also update the Robot Schedule Explorer GUI. Temporary Agent Jobs named RCLTFRF will be created in Robot Schedule while the RCLTFRF commands are being processed through Robot Schedule. If the temporary agent job processing the request completes normally, it is deleted automatically. If the request fails, the job remains in the Job Schedule List where it can be restarted (as needed) or deleted. If you are using mapped network drives on Windows servers, see "Using Mapped Network Drives with Robot Schedule Enterprise Windows Agents." Install and configure the Robot Schedule Enterprise agent on the systems currently configured as clients in Robot Client. Test the installation by running jobs on the agents from Robot Schedule Enterprise. Configure a mapping of the clients in Robot Client to Robot Schedule Enterprise Agents. Robot Client jobs using the RCLTFRF command will run on the corresponding Robot Schedule Enterprise agent system. 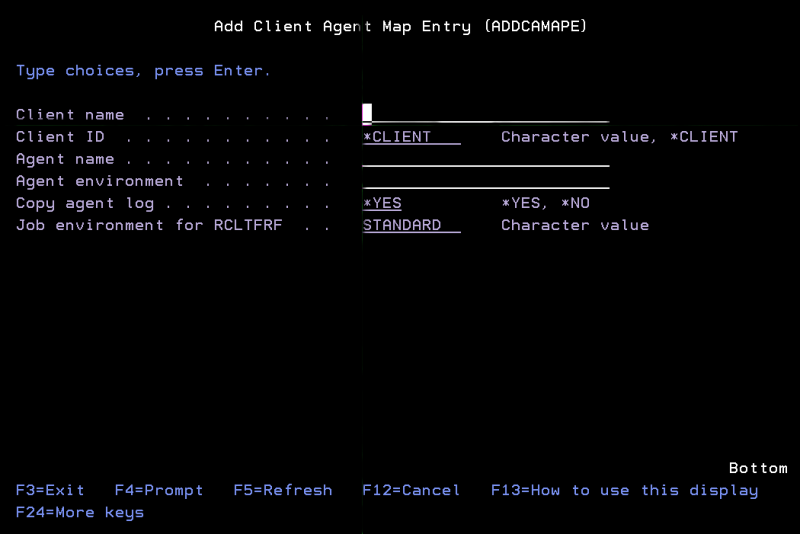 We recommend that you create an agent environment for each system you have mapped using Robot Client. Use the following commands to map clients to agents in your enterprise. Note: These commands are located in the ROBOTLIB library. ADDCAMAPE Creates a mapping of a Robot Client system to a Robot Schedule Enterprise agent. The image below shows the ADDCAMAPE panel and provides descriptions of the fields. DSPCAMAP Displays all of the defined client/agent mappings. CHGCAMAPE Changes a client/agent map entry. RMVCAMAPE Removes a client/agent map entry. Client name: Enter the name of the Robot Client client to be associated with an Enterprise agent. Client ID: This is the Robot Client client ID to be associated with an Enterprise agent. Leave as *CLIENT. Agent name: Enter the Enterprise agent to be associated with the Robot Client client. Agent environment: Enter the Enterprise agent environment. Copy agent log: Specify if the agent log is to be copied. Job environment: Enter the job environment. Note: Each entry shown by the RCLWRKPWD command is copied to a file that is used by the Robot Schedule Enterprise version of this command. Note: You need *ALLOBJ authority to run this command. After transferring the FTP information, use the FTP Server Identity Map Security Settings window to set up security on the servers. This window is found under System Setup in the Robot Schedule Explorer. If you can change the library list of your RCLTFRF jobs, replace RBTRCLLIB with RBTENTLIB. The RBTENTLIB library contains a copy of the RCLTFRF command that works with your existing syntax. Note: When the override is installed, Robot Schedule Enterprise intercepts the RCLTFRF command and will process any requests for Clients that have been mapped to Robot Schedule Agents. Requests for any clients that have not been mapped will continue to process through Robot Client. Do not remove Robot Client from the system until the override is no longer needed.